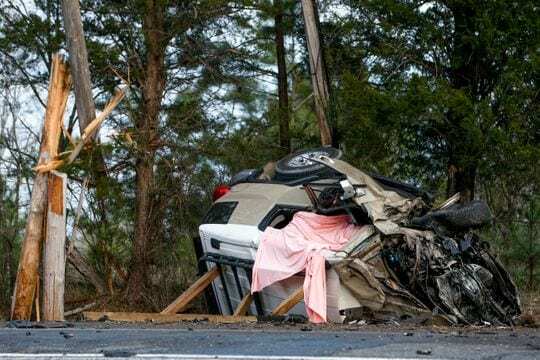 A couple was killed on Friday afternoon in Montgomery Country, Tennessee, when a speeding Jeep collided head-on with their SUV. Joseph and Mitzi Barr were driving down Lylewood Road in Woodlawn when a black Jeep, traveling in the opposite direction at a high rate of speed, crossed into the opposite lane and hit them head-on, flipping their SUV. The driver of the Jeep survived the collision and was immediately airlifted to the hospital. Although the couple was wearing seat belts, they did not survive. The Tennessee accident attorneys at David Randolph Smith & Associates have helped countless families recover for the loss of their loved ones. Click here for more information. The driver of the Jeep has remained unnamed, but is reported by the Tennessee Highway Patrol as a “juvenile driver”. One eyewitness stated that she saw the Jeep moments prior to the accident, traveling at a dangerously high speed and recklessly passing cars in the opposite lane. The witness also stated that the speeding Jeep was chased by a patrol car, which arrived on the scene of the accident almost immediately. According to the Insurance Institute for Highway Safety, over 37,000 Americans died in fatal car wrecks in 2017–over 100 people per day. Many such crashes are caused by reckless, negligent, or distracted drivers, who pose serious safety hazards to the hundreds of vehicles that they share the roads with every day. It is impossible to prepare for the sudden and tragic consequences of someone else’s recklessness. When the unexpected happens, however, it is vital that no time is lost in preparing to assert your rights against a negligent or reckless driver. Gathering evidence at the scene of the crash, interviewing eyewitnesses, and collecting data from accident reports are necessary and time-sensitive steps in the process of any auto-accident claim. When injury occurs as a result of someone else’s dangerous driving, you want experience and skill on your side. Call the Nashville auto accident attorneys at David Randolph Smith & Associates today.